What a long, hard winter it has seemed. Lousy weather, a string of overlapping sicknesses, chronic pain, and caring for a loved one with rapidly advancing Alzheimer’s is not the best recipe for success in the pursuit and procurement of happiness during the physically darkest months. (Always winter, and never Christmas, as C.S. Lewis described Narnia.) Just cold and dark and dull. Nothing to look forward to. I feel like I’ve been wandering in a dense, chilly fog of unanswerable questions and unanswered prayer. Sometimes the faith thing is hard. I wish God would just slice through the veil and let us SEE. But I can’t see his face through the fog. 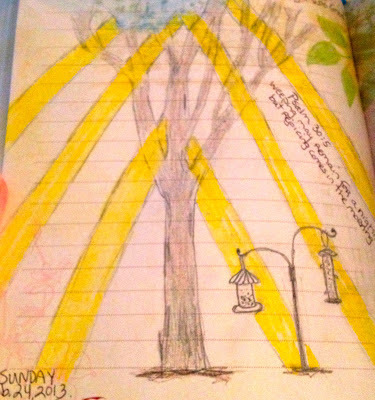 Last Sunday morning, I was cozy in bed with my coffee and devotional book. “Kim! Kim, come down here,” my husband called. “Is it mandatory?” I whimpered. “Oh, never mind,” he gave up. So of course I stomped downstairs. As we watched, thick yellow bands of light pierced through the heavy fog. It had been rainy and overcast for days on end. These iphone pics don’t begin to do the sight justice. They don't capture the vivid contrast of color. A day or two later, I ran into a friend who’s battling a debilitating illness. In spite of a daunting diagnosis, she is bravely hanging onto faith. Actually, her faith is growing stronger and stronger in spite of it. “We saw it, too!” I told her. From several miles away. A completely different vantage point. Sometimes it’s hard to see God. Where are You in all of this mess? we cry. God seems silent. The fog of unknowing remains. We stumble along in the dark, tripping over our doubts and fears. It is hard to keep looking up into impenetrable leaden skies. But, in an instant, God breaks through. The light of His truth slices through the darkness like a saber, scattering the obscuring fog of uncertainties. “A little while longer and the world will see Me no more, but you will see Me. Thank you for this!!! I needed this at just the right time. This too has been a hard, long winter for me. I spent the entire day (ugly) crying. My 3 little boys are tucked in and asleep and I'm sitting in my bed, my eyes almost swollen shut and feeling the guilt from my anger at God today. I was so angry at him b/c I keep waiting and waiting to see him through this horrible fog and my anger has taken me to a dark place. I KNOW he's here, but my faith has grown weak. I'm weary and I'm only 35. I just keep telling myself that I have to push forward and keep the faith. I have to be in constant contact with the Lord instead of pushing him away in my anger. Praying for you and always appreciate your thoughts so much. Thank you both for connecting and BEING REAL. This Life thing is not easy. We need to love and support each other. Bev, thanks for that extra measure of love and prayers! Christine, I remember how it was when my 3 were little and I was so exhausted. I am praying for renewed strength for you. The one thing that has gotten me through this sad, hard winter is filling the house with praise music, especially when I've felt like giving up. (Turn the volume up loud! sigh....yes. Thank you beautiful, beautiful. Praying for some Spring for you and Christmas, no, even better EASTER!!! Boy did I need to read this today! Thank you Kim, as always! I am so grateful you share yourself with us. It must be precious to have such a similar experience of God's light as your friend, as you are both walking on different but very hard paths. 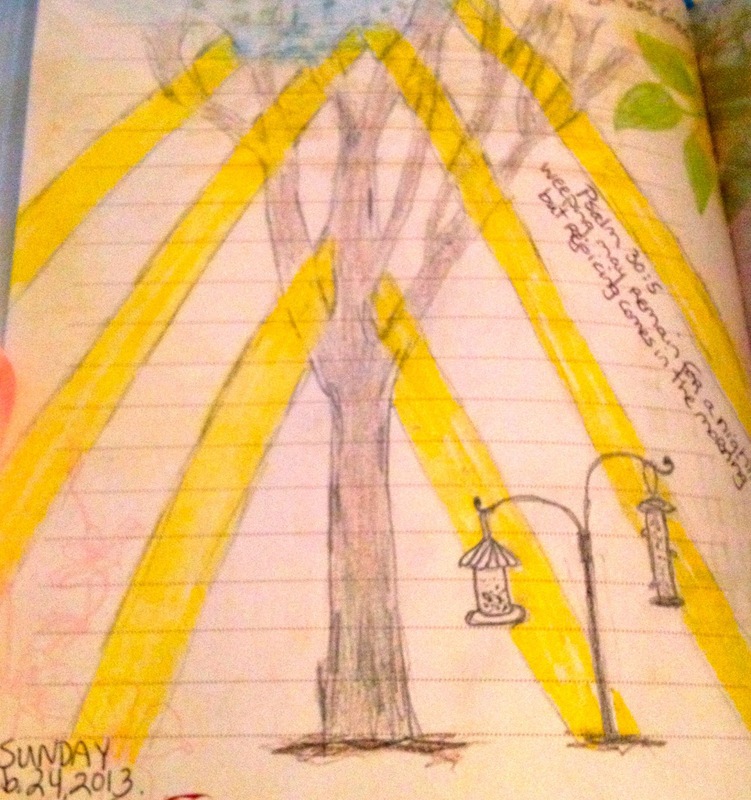 I love the verse about joy in the morning on her journal page. Frankly, I am ready for spring myself! Praying for a successful trip for Miss Katherine this weekend. Oh how I have missed your postings. I get it--no pressure--just saying you have been missed. I know exactly the fog that you speak of. I too am there, but if I listen and watch carefully God reminds me that He is right here with me. This season of waiting is hard. Thank you for sharing.